The T-Fal FV4495 Ultraglide is known for being very similar to the T-Fal FV4476 model, and the latter is the more affordable model between them. The FV4495 is more powerful with a stronger burst of steam, and it has an extra-long 12-foot cord. It also has a 3-way automatic shut-off function for your safety. For the same power and steam capability of this model, you would likely still pay more from high-end brands, so it still provides a great value under $100. This iron has one of the longest iron cords you will find with a length of 12 feet. This is helpful if you aren’t close to your desired socket or if your cord often gets in your way when ironing. The T-Fal FV4495 features a triangular heel with a high inclination that makes it less likely to tip over even on an ironing board. Some buyers claim the instruction guide for this model is hard to follow. If you need to use more complicated features and need instructions, they may be too confusing for you. 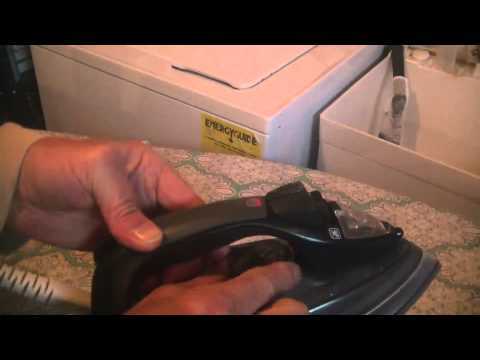 Some users don’t have this issue, but a few users noted that the iron can spit out water at various settings. It has also been reported to drop water when the steam burst is engaged. The T Fal Ultraglide iron uses over 1,700 watts to provide you with powerful performance, and the unit heats up very quickly. User have noted that it can reach the expected temperature even faster than the frequently sought-after Black & Decker D2030. It features a ceramic sole-plate that glides over clothing smoothly, and it has 64 steam ports to allow for more efficient straightening. Among those 64 ports, there are 27 large holes and 37 micro-sized ports including some on the tip and center. An ergonomic design was clearly the priority when the T Fal Ultraglide Easycord iron was crafted. It has an Easycord system that prevents the cord from getting caught up in the clothing as it’s ironed. Instead of falling near the end of the iron, the cord is kept out of the way much better than that of a standard iron. The T-Fal FV4495 is also lightweight, so it is very easy to maneuver while in use compared to heavier models. One of the unique features that really stands out with users in TFal reviews is the extra-long cord of this unit. The cord is 12 feet in length, and it can be wrapped around the triangle-shaped heel for easier storage. The heel of the iron is also designed to keep the iron stable and make it less likely to tip over. The high inclination keeps the iron balanced and stable even on your ironing board. The unit is not known for being cost-effective, but it does have many features for its higher price. If you don’t need features such as the 12-foot cord, you may be better with a less expensive but similar model. This T-Fal iron also produces a greater output of steam to support its price, and more steam makes ironing more efficient with long-lasting results.